I am second to none in my disapprobation of our First Commoner, the egregious poison dwarf Bercow. His preening self-love, acidic bitchiness, partisanship, unpleasantness and monstrous ego all make him utterly unsuited to be a neutral, self-effacing, universally regarded Speaker of Parliament. Cunning rather than clever, and with the manner of a bullying young master at a third-rate school picking on second-formers ( "Are those zits, Cameron, or have they been throwing custard at you again?") he will not have endeared himself to any MP committed to the dignity of the Commons. Yesterday as the result of the vote was announced he put his face through any number of pubescent contortions for the cameras, none adding a millimetre to his stature. Yet I agree wholeheartedly with the result of yesterday's vote. Gove screwed it up for Cameron - possibly deliberately? - and condemned Hague, who deserved a warm valedictory, to slink out of the House like a bad odour. It was clear his heart just wasn't in the motion, and prior to the vote when he was invited to escape the humiliation by withdrawing it, I'm sure he gave the idea serious consideration. The whole plot of a last minute vote was absurd, unparliamentary and partisan. Gove, no stranger to pomposity and self-love, has felt the rough edge of Bercow's tongue and it must have hurt. By stooping to Bercow's level in attempting to be rid of him, he mistook the strange ability of the Commons to do the right thing at the most unlikely moments. Britain went into the second world war with a 2lbr anti-tank gun that couldn't penetrate German armour and a 3mph infantry tank that could be destroyed with ease by enemy weapons. Whilst Lord Gort, commander of the doomed BEF, was exercising on his charger his German counterpart was doing unsportin' scientific war stuff. Our forces were still under the command of the effete and historical Gentlemen and awaiting the battle-winning Players to take the field. Gort's charger was eventually shot on the quayside at Dunkirk, not qualifying for a place on the destroyer home. Meanwhile Japan has just launched its first carrier since WWII in response to rapid Chinese military expansion, Russia has a programme of building 100 new warships between 2011 - 2020 and is bringing into service a long-range bomber with a top speed equal to our air defence fighters, Chinese naval vessels are anchored off African ports and the US is expanding its 'smart' war fighting resources (i.e. kit that doesn't depend on being operated by Americans - the average size of US pilots and submariners having doubled since WWII and with no sign of slowing). Of course Dave's commitment to maintaining the foreign aid budgets remains inviolable. The state of the Bundeswehr is analysed HERE and makes grim reading; the table below was released by the generals and is, er, 'optimistic'. 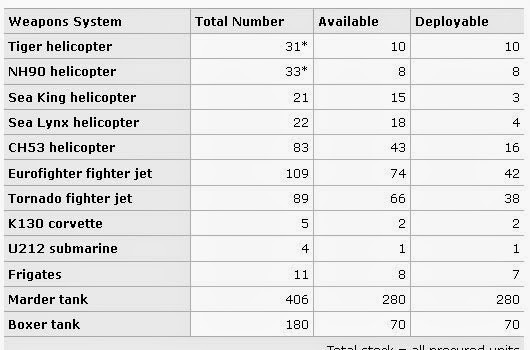 For instance, when it was released, only 2 of Germany's 33 NH90s were flyable and ALL of her Sea Lynxs were grounded. The entire political class appears to be in self-destruct mode. With the election only weeks away, they're falling off their perches in droves. And now Cameron, whose crap judgement far more than his ill intention has been responsible for any number of policy blunders during his term, has shot himself. He really isn't very bright. Even Gove on Newsnight couldn't resist chuckling away at the stupidity of it. The sole glimmer of hope is that the Commons have a new clerk. Bercow is pretending to be in agreement with the appointment of the old Clerk Assistant, David Natzler, as the replacement for Sir Robert Rogers. Whether the poison dwarf will be able to control his ill manners sufficiently to allow Mr Natzler to get on with the job will be another matter. However, with the potential for a hung parliament, at least we have someone familiar with Bagehot. Every week now brings some new turn, like a music hall that gives and gives. Hey ho. Not even Marks and Gran could have invented a script-plot as twisted as this one; Tory boy spends 27 hours in discussion with head of violent fascist street-group and is recorded plotting a fake white-knight scam to win Tory votes, then complains when the recording is released that the plot is taken 'out of context'. You'd need a heart of stone not to chortle at Afzal Amin squirming in a doomed effort to save his candidature. Islamist doctors leave for ISIS? Excellent! News that Islamist doctors are leaving the NHS to support ISIS is excellent news. The bureaucracy's discipline and efficiency procedures are simply too, too labyrinthine to get rid of them - and the damage that doctors who hate us can do if left in place is incalculable. So we're best rid of them, with hope they'll be obliterated by RAF air to ground missiles. Let's recruit some decent Irish, Australian or Kiwi docs instead ..